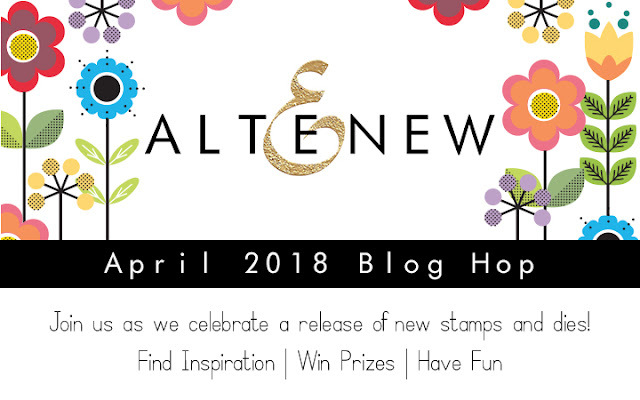 Welcome to the April 2018 Blog Hop featuring the latest release at Altenew. 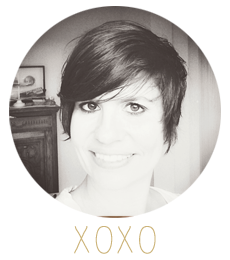 If you have hopped over from Svitlana Shayevich's blog, then you are right on track. You can always start the hop over on the Altenew blog. I created three layouts using a several of the new release stamps and dies. One is featured here on my blog and the other two are on the Altenew Scrapbook blog. For my layout I used the Gradient Die to cut out a fancy frame which I placed some patterned paper behind. For my title I used the HELLO die cut and repeated the word using the smaller Mini Hello stamp set. For detail I added some fun flowers just above the photo using the Folksy Flower stamp set. I love how this layout turned out and I got to use an older photo of my son and husband. No blog hop can go without some fun prizes. I am giving away and 30$ gift voucher to the Altenew store. All you have to do is leave a comment in the comment section. (Scroll down to the end of the blog post and click on COMMENT). Please do not use the contact form in the right hind column. Enjoy the hop and thank you for stopping by and leaving a comment. Oh! That 'Mega Hello die' has such impact. Really love the background of your project. Beautiful work. I am no longer a scrapbooker, but I love the artistic quality of your page. 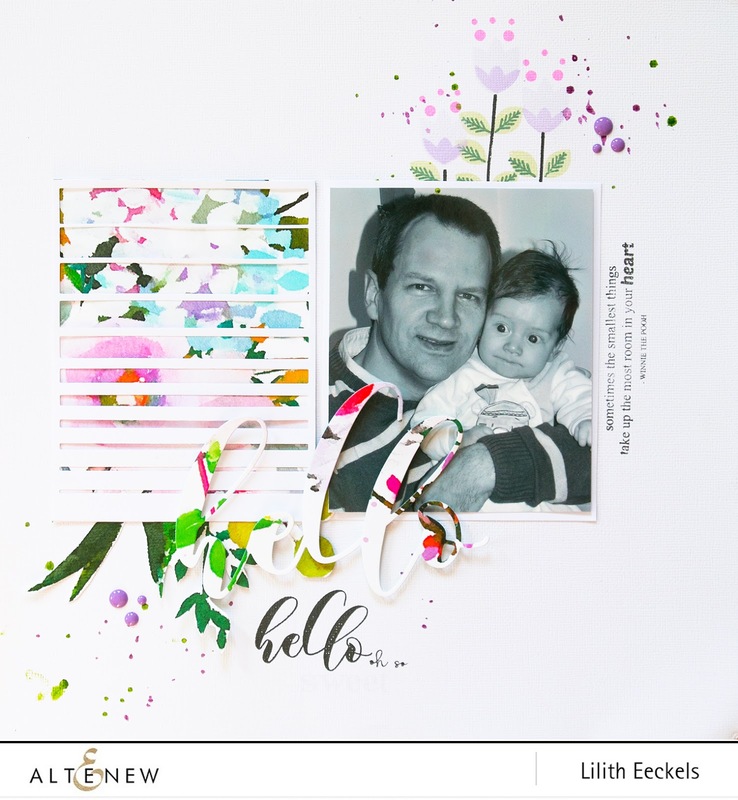 Thank you for showcasing Altenew's stamps in such a lovely way! Love that gradient die! Your cards are beautiful. AWESOME creation, such a sweet layout! I am totally loving the Mega words! Such a beautiful layout. Thanks for your inspiration Lilith. It is so nice to see a layout using the products. Thank you for sharing. I like that you used these in a layout for scrapbooking. Very beautiful layout. Love the way you have incorporated the gradient die in the design. I am loving the gradient die cut! Brings such interest to the background. A fun scrapbook page with your family. I think this is really clever, to use the die as a little window shade. Thanks for helping to get my mojo going in doing my wedding/life scrapbook going. I have all this 'stuff' taking up space and the best of intentions. Many thanks! I love the floral paper cut with the gradient die. Lovely layout. Thank you for sharing. Love your scrapbook page. So beautiful. Absolutely gorgeous layout! Love this new die! I love the gradient strips, thanks for showing a different way to use the die. Beautiful layout. Wow! What a beautiful page! What a beautiful layout! I love the use of the hello die cut from the floral images. Your layout is gorgeous! I love the mix of the gradient cover die with the flower paper...just beautiful! what a beautiful page. great use of the stamps. thanks as always for sharing. Omg...Your creativity is so inspiring. TFS! Love Altenew and this new release! Sweet layout using the gradient die! Wow! What a gorgeous page! I love how you use the Gradient Lines cover die to show the floral pattern peeking through! What a sweet layout. Those folksy flowers are my favorite! I really like the gradient die over the patterned paper. That baby if sweet too! What a beautiful layout! The gradient die is a perfect foil to the colors and designs. What a beautiful layout! Live this release! Such a pretty lay-out! Love the flower prints on the die-cut word... the sweet flowers look pretty in the background. Beautiful layout! I love that little face! The black and white photo is beautiful with the splashes of colours in the layout elements! Very handsome guys. I love your layout. What a lovely layout! I don't scrapbook, but this is very inspiring! Thanks for sharing such a fun layout. I love how you incorporate the new products. Love the use of the gradient die. Beautiful inspiration! Love that look on the baby's face...priceless! Love how you die cut the pattern paper on your page! I like the white stripes with the patterned paper behind it! It's another wonderful way to use this very cool die. Thank you for the idea!!! Hi! I really enjoyed the stark white contrast to the beautiful placed, stamped, and colored flowers on your scrapbook page! The gradient stripes die was creatively placed too; to allow your wonderful coloring job to peek thru. Very handsome photo too! Thank you for your page. I am loving this new release, especially looking forward to using the gradient stripes die and stamps. I love your layout, so pretty and cheerful....well done! I am not sure if my comment posted on this blog or not...so, I am posting again. I love your layout. These are great new products! Good job! Great layout. I like how you used the gradient lines cover die. Absolutely fantastic layout! Amazing picture and the sentiment is just perfect for it. What a beautiful layout!! The picture is so sweet!! Gorgeous!! Thanks for the inspiration!! Beautiful page. Such a great use of the Gradient Lines Cover Die. Hi Lilith, I love seeing your layouts using stamps and dies. They provide so much inspiration for my pages and cards! so pretty! great layout & such a sweet photo!! I love your beautiful background. Awesome! Fun layout and adorable baby! 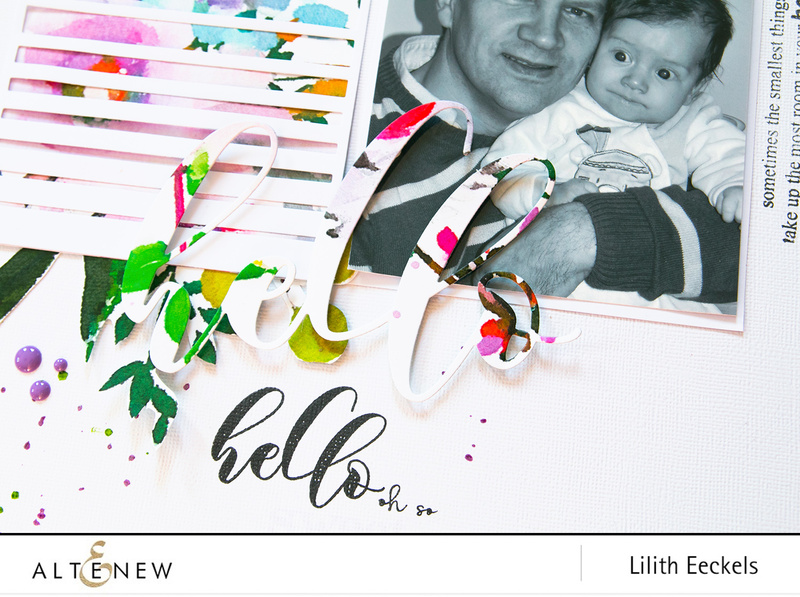 Nice colors and large Hello die cut added nice touch to your pretty layout! Beautiful! Love the colors mixed with the black & white photo. I loved your layout using the new release! Thank you for the inspiration! Such an adorable layout! Just precious! Beautiful layout! The folk art flowers at the top of your page are lovely. Very pretty layout, love the flowers behind the gradient slats. Lovely page layout.. Love the new dies and stamps in this release. Lovely page! The Gradient set looks awesome. Thanks for highlighting it. You produced a beautiful effect with the diecut on your layout! Very Cute Photo!! Great Layout!! Very creative!! Love seeing layouts using Altenew. What a sweet lay out! I love your cards too. I loved how you layered the die background over the top of your colored flowers just letting a little color peek through. This scrapbook layout is marvelous. The tiniest subject on the page is adorable! Thanks for sharing. Love how you put the gradient die over the stamped background. Such a beautiful page! Beautiful and bright layout. Love the die cuts and florals. Lovely layout! I really like the gradient stripes stamp and die cut. love how you used the gradient stripes (just ordered it!!) with that sweet picture! What a gorgeous stamp page! What a cool layout. I would never have thought to use the gradient die on a scrapbook page. Fabulous. Love your LO and your adorable family! You have really opened my mind to new ways to use dies and stamps in scrapbooking. Thank you for your great ideas! Wonderful design for the page. This release ROCKS! I love your clean and simple layout! Splashes of color are superb! Loving all the different techniques and sets that you used to create this delightful layout! TFS! Beautiful layout. I love the big font. Beautiful layout. I’m in love with the mega sentiments! What a gorgeous layout you've created! Love everything about it! TFS! Your page is absolutely beautiful. Love the way you included the Gradient Stripes. TFS! Great layout! Love the flowers and the beautiful hello. Great job! A wonderful layout! Love the gradient window with the flowers peeking out & the great family picture! This. Hop has been incredible.....loving all of the great samples..thank you so much!!!! Beautiful layout, thanks for sharing. Beautiful scrapbook layout! I love the various styles and ideas. Wonderful page pretty floral die cut word. I adore your page, Lilith! So creative. Your designs always inspire me! This is a wonderful layout. I'm a new Grandma and have a darling little baby granddaughter to love and make scrapebook layouts for. This layout gave me great idea's for a start. This layout is DARLING!! It is always a treat to see new products featured in scrapbook pages and not just cards. Love the layout and especially how you cut the mega hello diecut out of the patterned paper so its blending in and yet standing out. Beautiful layout and I have so been enjoying your videos on Altenew channel! Lovely page layout with the gradient stamp and the beautiful mega hello. I couldn't wait to see your design. As always, a pleasure to learn from you. Your layout is so precious and sweet!! Love how you incorporated all the different Altenew elements into it and showcased the new releases!!! Am in awe of your talent! Your layout is so sweet, love how you used the gradient die! Such a sweet and pretty layout - love the Folksy Flower set. I love what you did with the stamps and dies here, what a gorgeous page!!! I need to get my mind in Scrapbook mode to document my daughter’s recent trip to Spain. Thank You!!! Love this! Stripes are perfect compliment to florals! What a sweet layout. So colorful and bright. Pretty layout. That gradient die is awesome!!! Beautiful layout, love the photo! Thanks for sharing. What a fun and lovely layout! Thanks for sharing your talent! Gorgeous layout 😍. Love your use of gradient die set for the floral pattern frame. So clever!! Very soft and pretty layout... Thank you for the inspiration! Lovely layout with a great colour palette. What a beautiful layout! I love how you used the Gradient Die to cut out the frame, This is so lovely. Thanks for the inspiration. Beautiful layout. I also really like the later post you have using the Watercolor Dots. Thanks for sharing. Beautiful layout! Love the 'hello' die and stamp, and the awesome gradient die! PRECIOUS photo and lovely layout! Beautiful layout. I love the dies you used. What a layout! great job!